Seven years before leaders of the Church of Jesus Christ of Latter-day Saints (LDS Church) set foot in Utah Territory, they had already breached the Pacific basin by arriving in Australia by 1840. Scholars have increasingly analyzed the Pacific world (the west coast of the U.S. and South America, the Pacific islands from Hawaii to Tahiti, and from Japan to New Zealand and Australia) as a distinctive region with a unified history. While religion has played an important role in this history, giving rise to a literature on Protestant and Catholic missions in the region, the study of the LDS Church’s expansion into the Pacific has remained largely outside of the bounds of non-LDS study. The Pacific basin has been a crucial part of LDS Church history for nearly the entire lifespan of Mormonism. 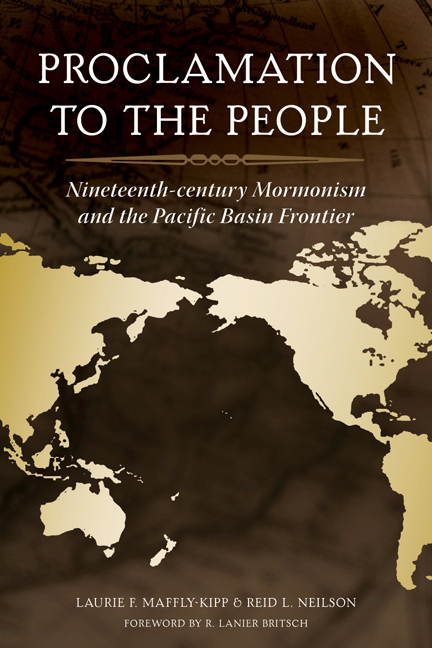 This volume brings the Pacific history of the LDS Church into focus in two ways. First, it explores the range and meanings of the church's settlement and movement. Second, it suggests contrasts, linkages, and parallels between LDS and other missionary activities. Laurie F. Maffly-Kipp is associate professor of religious studies at the University of North Carolina, Chapel Hill. Reid L. Neilson is assistant professor of church history and doctrine at Brigham Young University.